Every month we pick one of our favorite writers to highlight considering their entire body of work and the November pick for "Mystery Playground Recommends" is Elizabeth George. Many people know the Inspector Lynley series from the PBS Mystery! shows, but the books are so good, they are worth diving into even if you have seen the series. Barbara Havers is a real (fictional) person. She gets crumbs on her shirt. Sometimes her shoes don’t match. On occasion, she cares too much, but all the best people do. She is really patient under extreme circumstances. So even though she is fictional, she’s real to me. Havers and Lynley are friends. They have evolved to be more than work colleagues, and it is still just friendship between a man and a woman, which some people say isn’t possible. They have almost nothing in common, except for the really important things, like values and loyalty. I get to go to England. I love England. Reading about England in beautiful detail is the next best thing to being there. If I read one of George’s books, I don’t have to worry about jet lag or a ride to the airport. And let’s face it, hardback books are expensive, but compared to a single night in a London hotel, it’s darn cheap. The characters change. Life changes. These characters change. Bad things happen. Bad things happen to all of us too. I have laughed and cried while reading these books. I know there are some people (you know who you are, and we must respectfully disagree on this point) who never like characters to change. That gets a little tedious for me. George takes risks and I keep reading. The relationships are complicated. The main characters have history. It plays into every book in new ways. In case you haven’t read the books, or seen Mystery!, I won’t go into details here. You should just trust me and get a hold of a copy of A Great Deliverance now. Every book is different. The same four orbital characters are always there – Barbara, Thomas, Deborah and Simon, but different characters are featured and the story always varies. Many series have “jumped the shark,” went on too long and declined in quality, after ten or eleven books. Elizabeth George is still going strong after sixteen. 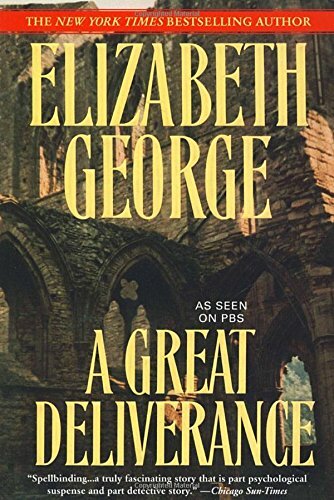 Elizabeth George is one of my favorite authors, and I heartily recommend all of her books.